Myth – You have to do skills to pass courses, once you have the card you never need to do them again. Fact – Training courses are designed to teach you the skill and knowledge you need to start diving at a particular level . The best divers use their training as a launch point, they practice and improve their skills and continue to expand their knowledge. If you do nothing you won’t even maintain your level. Your skills and knowledge will quickly erode putting you and anyone you dive with at risk of diving beyond your current level of competence. 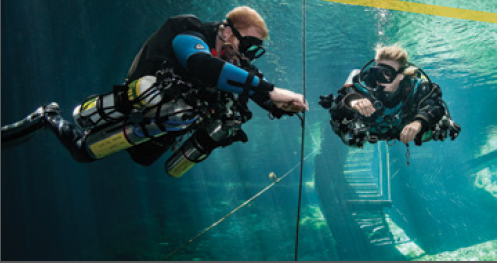 Although this wasn’t a deco dive, Jared and Vikki practice their decompression and gas switching skills so that they are ready for the next dive. Myth – Dive kit never goes wrong. You can just throw it together and jump in. Fact – Meticulous preparation of equipment and use of checklists prevents deaths. Although equipment malfunction may be rare, diver error is less so, but proper preparation can avoid both problems and don’t forget the chances of equipment going wrong increase if it is not properly maintained . Swimming slowly and quietly without trying to chase or grab animals results in the best wildlife encounters. Myth – I’m only one diver – it’s ok if I ……kick the bottom, break the coral, ride the dolphin etc…..as long as nobody else does it. 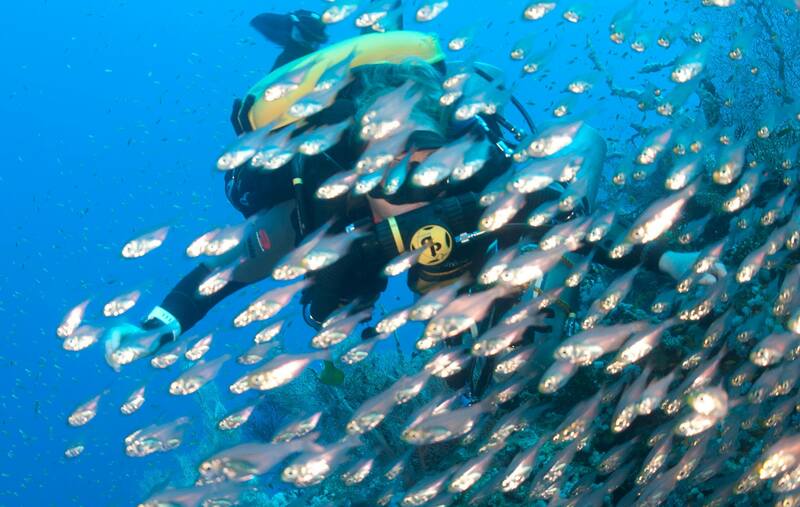 Fact – All diving environments and creatures come under environmental stress. We must all minimise our impact and think of what is best for the environment, rather than ourselves. Even seemingly indestructible environments such as rocky caves can be damaged by a clumsy diver, destroying millennia of development. My rule is that I try not to touch anything. On many technical dives that involves gaining experience of equipment (and how “big” I am when wearing it) where there is plenty of room for error. It also means being absolutely sure that I know where all of “me” is before I pick up a camera or anything else that can distract me and reduce my awareness, such as a DPV. If an animal wants to touch me (Seals for example) I stay still and let them come to me. I know it’s tempting to touch things, but what is the benefit to them? If we disregard the occasional animal that has suffered man made abuse ( e.g. caught in netting) there is very little they have to gain and maybe a lot they could lose by our interference. It’s time for us to stop being so self-centered and put the welfare of other critters first. If they do choose to interact with you, the experience will be even more magical, because you will know they have chosen to take part of their own free will, not because you grabbed them! Check out Project Aware’s new “ten tips for divers” it’s not just for newbies – if we want tec divers to continue to be seen as role models we need to be the best at this part of diving too! Next PostNext Where have all the heroes gone?